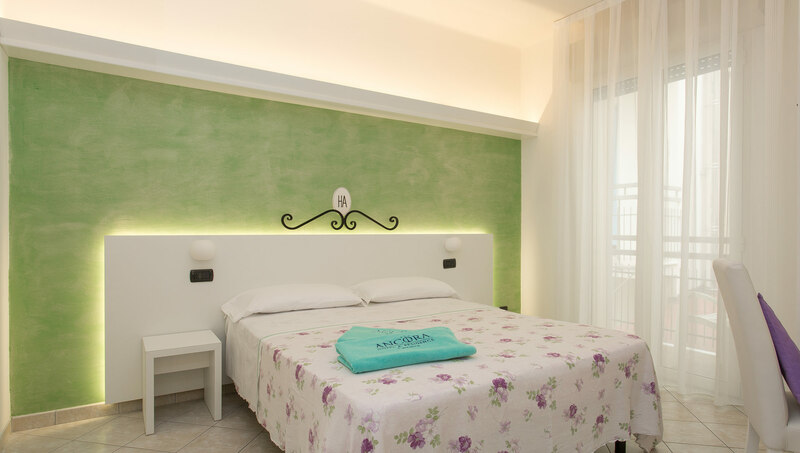 The Ancora Hotel rooms blend comfort and relax. Your room is the place where to unwind and relax and we are always on hand with a commitment to making your time a fond memory. Cleanliness, bedroom and bathroom linens and anything else that makes the difference is very important to us. All the rooms have balcony, hairdryer, deposit box, air conditioning, LCD TV, refrigerator, minibar. this is what we are and what we want to be! If you choose to travel on your own or if you want your privacy. The guys that are staying at Ancora Hotel with their family love this solution very much. They can have a private space and at the same time share happiness and smiles with their parents! Are you two? Even more the room tells about us, about our philosophy of hospitality. Let us tell you that we love to host the grandparents coming to meet their sons and grandchildren, or that simply want to enjoy a holiday by the sea. We have special offers for them! Ask for information! How wonderful are our family rooms! Tell us about your needs, your children age and your habits; we have the right room for you! From high sides travel cots 0-3 years to single beds for older children: we have the right solution for every family. And for those that love even more comfortable spaces there are the Super Family Rooms, max occupancy up to 4/6 persons, these rooms feature en suite double bathroom. This solution allows you to enjoy your privacy and the time spent in your room. These rooms feature one double bed and two single beds with possibility to add high side travel cot or junior bed 1,30 m.